Ideally, I would like to type Name. 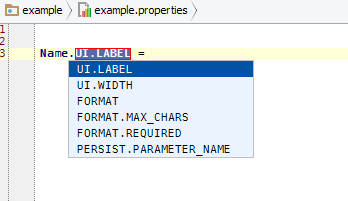 Once I type period and press ctrl+space, I would like to see what definitions I can select, e.g. UI, FORMAT, etc. My research has pointed me towards building a plugin, possibly. But, before I dive into that realm, I would like to see if you guys have any other ideas to achieve this. But a live template (File > Settings > [IDE Setting] > Live Templates) could also work. Then you would just need to type, for example, name[tab] (where 'name' is the abbreviation you configure) to select your option. And like code complete, as you type, your available options are narrowed down.